Andrew Barker: Beatles fan. And librarian. Andrew Barker is Head of Academic Liaison on Special Collections and Archives at the University of Liverpool. 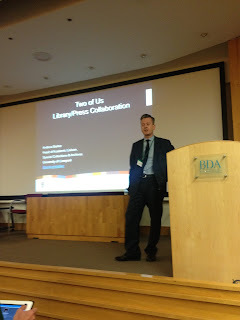 He talked through a partnership between Liverpool University Press and Liverpool University Library, with support from Jisc, that focused on finding a new way of fulfilling student need via a desire to challenge and complement long established scholarly publishing practices through the in-house creation of two bespoke e-textbooks. Barker established a relationship early on in his time at Liverpool with the University Press (and ALPSP Council member) Anthony Cond. They tried to establish early on discussions about how they can move the discussion on to something more useful. From a librarian's point of view, he has met a lot of publishers. They get on well with them, but there's always a suspicion they are trying to rip them off and not let them do what they want to do: that it's an unhappy relationship. What a publisher might say is that librarians just moan at publishers. They have tried to get beyond the cynicism and suspicion of working with each other. There must be things they can do to generate a good partnership. Anthony Cond came to them to discuss an idea about setting up Modern Languages Open - an online OA journal. The was discussed with the Advisory Board. They then began to consider whether they should collaborate on monographs. The backdrop to this is that there is a growing perception that teaching and learning is not the most important thing with this view supported by the growing resources online. As a result, they decided monographs were not the right area to collaborate on. So where was the real need? Student expectation is key. Every book on a reading list is available in the library in sufficient numbers at point of need. Why does it matter? The student experience as reflected in the National Student Survey combined with £9,000 fees. They have almost miraculous 82% of books on reading lists available. This is very high and is a real challenge. For Barker, student experience is key, the survey results will follow. Their users tell them resources are out of date or unavailable, there are limited resources. Expectations are sky high. Students will voice frustrations about seeing new buildings, but not being able to get library resources. When a student can't understand why the library doesn't just buy an ebook, it is hard to explain that it is because the publisher won't sell it to them in the way the student wants it. They are not interested in that level of detail. Often, ebooks are also very flat PDF type. Publishers need to produce slightly more engaging ebooks. When the Jisc call for proposals came out, they came together. They sent the proposal to the humanities and social sciences faculty. The LUP team put a call out to academics across the university. They turned round two bids for HSS in time. The first project was a Financial Management book for a module that has 900 students in remote locations. The students currently use a book retailing at £56 and there was some dissatisfaction with it. The module is also taught in the Chinese partner university. Much of the material exists in lecture notes and VITAL. it will be OA and print on demand. They are using a platform called Xerte and should have a massive impact on a lot of students who won't have to chase access of one print copy of a book. The second book is about primary sources that makes use of the special archives they have. It is one of the unique selling points they have (e.g. Roger McGough, Cunard archives). It will be used across taught schools. They are using Biblioboard tool which is good for images with sections on how to use primary sources. They are currently working at the writing stage. Academics will create the text, the Press will select, shape, edit, credentials, produce POD, market and distribute. It plays to both their strengths. So far it has been well received by the Pro-Vice Chancellor and University Librarian. This will prove crucial to ensuring sustainability for the approach in the long term. Andrew Barker spoke at the Personalised Learning and Publishing Partnerships seminar.